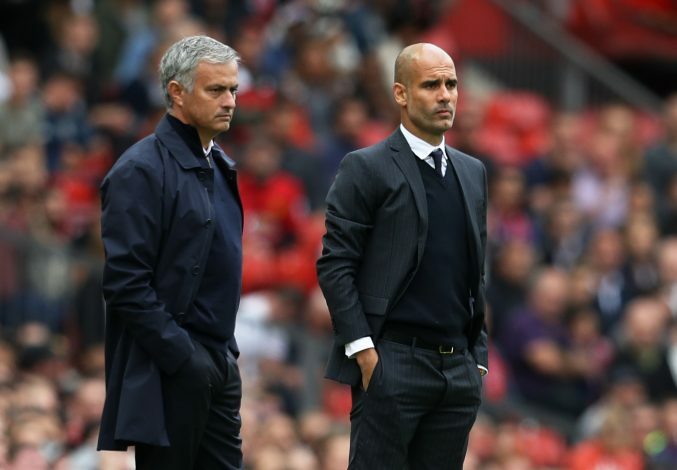 Manchester United are 10 years ahead of Manchester City, according to Pep Guardiola, who admits his current employer’s fierce rivals still enjoy an unrivalled prestige in English football. Guardiola replaced Manuel Pellegrini at the Etihad Stadium despite Man City having secured Champions League football under their former boss. Manchester United, on the other hand, are going through a rebuilding period under Jose Mourinho, after scrapping Louis van Gaal in the summer. In the three-and-a-half years since Sir Alex Ferguson’s departure, United have managed to win only one major honour – the FA Cup. Meanwhile, City have won the Premier League (in 2014) and also lifted two League Cup trophies. However, Guardiola surprisingly concedes that his current club still remain eclipsed by United, and thinks 10 years’ worth of Champions League football will be the only way to catch their bitter rivals. “We don’t have the history with this shirt, of Barcelona, Juventus, Munich or Manchester United. Not their titles,” the former Bayern Munich and Barcelona manager told The Mirror. “It’s about being in Europe and over the next decade to be there [in the Champions League] every year. That’s more important to this club than winning one title, believe me, more than that. “We have to convince people at this amazing club that they are good. They are good. And the fans as well. Guardiola has cut a frustrated figure in recent weeks after an initially positive start to the season. After winning their initial 10 fixtures, City have stumbled upon a rough patch, and now sit seven points behind league leaders Chelsea, having played a game more. Pep is hundred percent correct,man city is still junior nor matter good performances.Also Mourinho is the best manager in the world.only chelsea lost hope and faith in him too quickly.when he arrived at man u he find that team on a verge of collapsing.he took his time despite critism from fans around the world now he has found combination and people are quiet no comments.